A favorite location for GASPS chief investigator KyL Cobb, the Bailey house inspired Cobb to begin writing a history of Griffin, Georgia. The town of Griffin, Georgia sits at the southern end of the Georgia Piedmont Region on land that belonged to the Muskogee until 1821. The west end of the city also once held burial mounds (most likely Mississippian) but those are long gone. 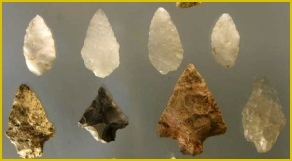 The 1821 Treaty of Indian Springs set the stages for a lottery to divide up the land. In 1826, the first United States Post Office opened in the region and the area became known as Pleasant Grove. On 10 December 1836, LL Griffin petitioned and received a new charter changing the Monroe Rail Road into the Monroe Railroad and Banking Company. 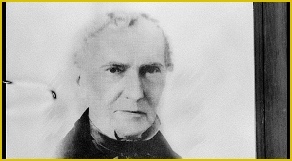 As part of the plan, in 1839, General Lewis Lawrence Griffin, acting as the Monroe Railroad and Banking Company, bought 800 acres in the newly formed Pike County from Bartholomew Still. The plan was to make the new town the center of both a North-South and an East-West railroad. Monroe Railroad had the state charter to do the North-South rail line to what would become Terminus (Atlanta) and it planned to do the East-West. On Monday, 8 June 1840, General Griffin held an auction for the land that would become the city. With the birth of the railroad, the new transit line brought the cotton growers. On 28 December 1843, the flourishing town, now called Griffin, had incorporation completed. Prior to War of Northern Aggression, Griffin became a thriving Cotton town in the middle of a boom. Five colleges had opened there, a wooden plank road ran from Griffin to Alabama. It even had its own fire brigade. Griffin briefly became so important that on 14 July 1859, Senator Alfred Iverson started fanning the flames that would lead to secession in a fiery 2-hour speech delivered in Griffin. Iverson presented the case that the South was no longer an equal partner in the United States experiment. The speech was transcribe and reported throughout the South and even debated in the United States Senate. 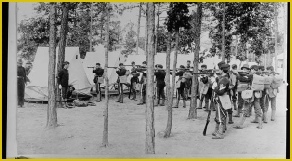 The War of Northern Aggression saw Griffin hosting the second largest training camp in the Confederacy, Camp Stephens, as well as a Calvary camp (Camp Milner). Because of the its position on the rail line, Griffin found itself hosting dozens of Southern newspapers and magazines displaced by the advancing Union forces. After the fall of Chattanooga on 25 November 1863, Griffin placed host to at least five displaced Confederate hospitals. As the wounded flooded in, Griffin was the last stop for Confederate and Union wounded. Filling schools, churches, and even private houses, for months ever train from the north brought horror stories. the enemy are gone... They did little or no damage to the place. They burned a large warehouse, filled with private and government stores, and gave the contents to the negroes and the poor people. They fired the turning-table, which is still burning; they were in the act of setting fire to the ticket office, when Mrs. Rawlings implored the commanding officer not to do so, as her house would be burned too. He told her, if it would benefit the United States Government ten thousand dollars, and destroy ten cents worth of private property it should not be burned. ... One of the stories afloat is; that they had no idea of coming here; but the mayor and some citizens met them some miles from town, and offered to surrender the city if they would spare private property. Following the war, Griffin never truly recaptured its pre-war prosperity. The rebuilt Atlanta permanently overshadowed and eventually lead to the decline of the city’s prominence. David J. Bailey was born in Lexington, Georgia on 11 March 1812. He spent his early life being educated by a private tutor. A special act of General Assembly was passed in 1829 to allow 17 year-old Bailey to practice law and join the bar association and in 1831, he was admitted to the Bar of Georgia. At the age of 20, he was elected to the General Assembly for Butts County but was refused a seat because of his age. In 1836, Bailey served as a first Lieutenant in the Indian war and then fought in the Seminole war in Florida. By the time of the Creek war in Georgia and Alabama, Captain Bailey was a seasoned soldier. In 1835, he was finally allowed to be seated in the General Assembly where he served as a member of the State House of Representatives in 1835 and 1847. Bailey also served in the State Senate in 1838, 1849, 1850 and 1855. From 1839 until 1841, he was elected Georgia Secretary of State. Bailey also served in the 32nd and 33rd Congresses as a member of the US house of Representatives from 1851 until 1855. In May of 1841, Bailey married Susan Mary Grantland, the daughter of Congressman Seaton Grantland. While in Congress, Bailey is most famous for his opposition to the repeal of the fugitive slave law on 28 July 1854. David J. Bailey does not appear in the 1860 census of either Butts or Spalding County. The Spalding County census ended 6 July 1860, so it is safe to assume the house was not yet occupied. Several historical records assert that Colonel Bailey himself actually moved to Griffin in 1861. Hon. 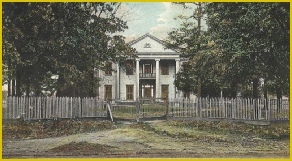 David J. Bailey, Sr., built the old Bailey home on Meriwether street, and just in front of the Bailey place is the old home of Curtis Lewis afterwards known as the Drake place. The present home of Mrs. D. J. Bailey on Tenth and Solomon streets was built by Rev. W. J. Keith. In September 1861, Georgia Congressman David J. Bailey established Camp Bailey with the permission of Governor Joseph E. Brown. 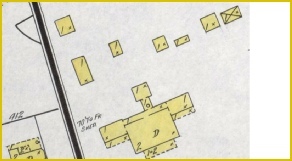 Camp Bailey was located between Fairburn and Palmetto, Georgia along the railroad track. The actual location of this site is not known today, but is believed to be under the Owens Corning Plant. Bailey recruited men of Campbell and Carroll Counties along the Chattahoochee River for the Confederacy. This company became known as Company K, the "Chattahoochee Volunteers". Company K was joined at Camp Bailey by ten other Companies that were organized from Butts, Bartow, Fayette, Clayton and Chattahoochee Counties in Georgia. On December 16, 1861, the 30th Georgia moved to Griswoldsville in Jones County, Georgia. By the 23rd it was encamped just below Savannah, Georgia. While the Bailey’s were settling into Griffin, DJ Bailey assumed command of the 30th Georgia Infantry that was assembled 10 October 1861. As was the custom at that time, then Captain Bailey was actually elected as the commanding officer and assigned the rank of Colonel. He had considerable difficulty in getting arms for his regiment, but after months spent in this effort, he finally succeeded, and it was believed he paid for the arms himself. He was quite popular with the men of the regiment and endeavored at all times to have them cared for as well as those of other commands. So zealous was he in this respect that at one time he incurred the displeasure of Gen. Lawton, then in command at Savannah, who threatened to arrest him, but Col. Bailey defied him to do so. Dr. Horton called this morning with a young lady, Miss Bailey, who requested Mrs. F and myself go and stay with her, as she was in a large house, and no one with her but negroes. If she left, it would be certain to be destroyed by the enemy. Neither of us could go. I felt very sorry for her, as she can get no one in the place to go with her. All are remaining at home to take care of their property, Her parents are on a visit to South-west Georgia; and so, like many other families, they are separated. As of the 1860 census of Spalding County, there were two other Bailey families living in Griffin: William Bailey and Eliza Bailey. William had no children. Eliza had daughters but the youngest daughter (Elizabeth M. Bailey) would have been 20 or 21 at the time of the event mentioned above. Eliza Bailey lived in the 1001 district of the Spalding County survey, which was downtown Griffin. The discounting factor on Elizabeth Bailey being the young woman is the reference in Cummings to the “parents” being on a visit. The 1860 Census shows Eliza Bailey being 69 in 1860 and a widow. This is not entirely conclusive. There are no discoverable official or contemporary records expressly mentioning the house. The earliest mention of the house being used as War of Northern Aggression hospital seems to come from an article in 1905. The destruction of the SP Moore Hospital in 1864 did required six buildings be “taken” as replacements. At least four buildings, including the Bugle Horn of Liberty building and the First Baptist Church can be expressly identified. The others remain lost in time. Another possibility is that following the surrender, the house briefly acted as a recovery ward from the battle of Atlanta. At this time, the house would have been far from empty with six children, the Colonel and Mrs. Bailey living there. While the “capture” of Griffin lasted only one day, the period that followed in the power vacuum was less orderly. The civil unrest following the war could also explain the “scattering of the books” legend. Rather than having been a part of the actually invasion army, many profiteers took to raiding throughout Georgia. Therefore, while family legend may blame the Union soldiers, the origins of the stories may rest with simple criminals. It is important to remember, the Union soldiers that “captured” Griffin were not allowed to cause extensive damage and mayhem to private property (see page 140). Following the war, the establishment of a place to bury the Confederate dead became a matter of great importance. A Society was formed expressly to re-inter the dead in Stonewall Cemetery. Once the dead were moved, a second organization, the Griffin Memorial Association was created to “as a society to care for the war graves.” Mrs. DJ Bailey was part of the executive committee. For many years, the Bailey house was exchange number “1” in recognition of the fact that it was the first telephone in the exchange and, in part, because Colonel Bailey also served as the manager. Beginning on 14 May 1890, Colonel Bailey was confined to his bed with inflammatory rheumatism in his spinal cord. His condition was so serious by June 1890, that not only was it expected that he would remain bedridden, he was expected to die before July 1890. As a result of his illness, Dr. Annah Bailey Voorhies returned from San Francisco to be with her father before his death and for the first time in 14 years, the entire living family assembled. 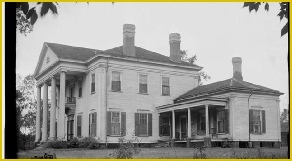 According to the Jackson Argus newspaper, Colonel Bailey lived in the house until his death on 14 June 1897. Griffin, Ga. – June 14, This morning at 3:30 o’clock Col. D. J. Bailey breathed his last at his residence on Meriwether Street, after being confined to his bed for about eight years. Col. Bailey was one of the most prominent men in this section and before the war was a member of congress, representing this district. 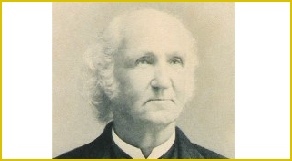 He has also represented Butts County in the general assembly of the state and was a member of the secession convention. Col. Bailey was a citizen of Butts County in his youth and early manhood. Here it was he imbibed the good principles, which distinguished him in after life. He joined the Masons here at Jackson in the 40’s and though he moved away he kept his membership here and was at the time of his death a member of the old St. Johns lodge. His many friends in this county will ever hold in highest esteem his worthy name. This obituary disagrees, on several points with the obituary in the Atlanta Constitution. According to the Constitution, Bailey was only bed ridden for the last seven weeks prior to his death (as opposed to eight years). In all likelihood, the “seven week” reference in the Constitution is a typo and should read 7 years. This seems to be supported by multiple articles mentioning him during this period including a Columbus Enquirer-Sun article in 1890 as well as Constitution article in that same year. The Bailey family is buried in lot 133 of the Oak Hill cemetery. As far for the life of Susan Bailey, very little documentation remains distinct from her husband. Susan Grantland, the eldest child of Mr. Grantland, married the Hon. David J. Bailey, of Griffin, who left six children, among whom was the late Hon. Seaton Grantland. The only two surviving children of this union being David J. Bailey, of Griffin, and Mrs. Anne Vorhees, of California. On 13 April 1890, Susan Bailey that appeared multiple articles in newspapers around the state. Mrs. Bailey and two grandchildren were returning from an evening drive. Before reaching home, the horses became unmanageable and ran through the gate. The carriage was destroyed and Mrs. Bailey was thrown out, receiving a dislocated hip. Grandson Brad Fowler had his ankle broken but the other grandson was not hurt. There is also mention of Susan Bailey as part of a lawsuit in 1894. According to the lawsuit, Mrs. Bailey was sold shares of stock in a land Investment Corporation scheme. The company founders were supposed to invest a certain dollar amount value of land in north Georgia as part of their investments. The lawsuit asserts that the land that was to be invested was valued only at a hundredth of the agreed value. At the time, the lawsuit was quiet spectacular and the Atlanta Constitution devoted almost half a page to the coverage. Unfortunately, no record of the results was discoverable. Facts about the life of Sallie Tebault seem to be confused at best. Most sources list Sallie’s birth as 1842/43. But she does not appear in the census in 1850. It is clear that she married Christopher Hamilton Tebault, M. D. in 27 December 1866. CH Tebault was a successful doctor and became an advocate for veteran’s health. In spite of Sallie’s life in New Orleans, there are many references to her visiting Atlanta and Griffin over the course of her life. The historical records seem to assert following the death of her parents the Meriwether house was not used by Sallie. The house remained under the ownership of Sallie Bailey Tebault until her death in 1926. From her, the ownership passed to her son, Grantland Tebault. During the 1897/1898 smallpox outbreak, the small military hospital at Camp Northern was flooded with soldiers with smallpox. As the situation worsened, several unused buildings were converted to use as hospitals. While the smallpox outbreak only ravaged Griffin for a few months, it clearly left the impression that a hospital would be essential to the town’s survival. The question became one of funding. 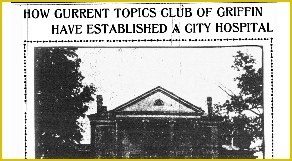 Around 1902 a women’s organization called the Current Topics Club of Griffin decided that they would create a hospital. By June of 1903, they had raised $1200 through “junk” sales and theatre performances. They also had additional pledges of almost $1000. The group rented the abandoned Bailey house as their temporary location. On 6 September 1903, the hospital was dedicated and opened to the public. The hospital was described as having two charity wards, two pay wards and two private rooms. Twelve total beds were served. There was also a dining room and a reception room. The annual operating budget of the hospital was around $2500 but it is clear that it also existed with community support. Public charity events such as the missionary society of the First Methodist church holding “a linen shower … at the parsonage for the benefit of the hospital” in 1907 bolstered the hospitals continued survival. Only on a 3-year lease, the Bailey house served as the Griffin Public Hospital until the 1907 completion of the new hospital. On 8 November 1936, the house was cataloged and photographed as part of the Historic American Buildings Survey. Photographer L. D. Andrew took four photos and captured data about the house. Starting in 1939, there are hundreds of references to the Frank S. Pittman Funeral home including the funeral of Dr. Thomas Jefferson Collins, last surviving Confederate Veteran in Spalding County. As the current history of the house presents, this business operated at the residence until the 1970s. An execution at Camp Milner, the second largest Confederate training camp, during the War of Northern Aggression. 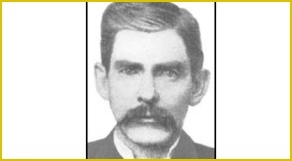 Famous for the shoot-out in the OK Corral, John “Doc” Holliday was born and owned land in Griffin. Rumor has it that he is even secretly buried here. Griffin also hosts the Doc Holliday museum. 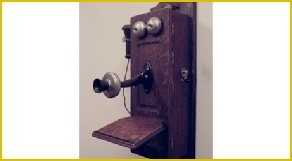 Example of an 1889 telephone like Colonel Bailey had installed as Griffin’s first home telephone.